A steam cleaner can really help to keep your home spotless by easily shifting dirt and grime. But this hasn’t always been the case. All too often our testing uncovers substandard models that do little to shift stains, or that are so unreliable their steam output drops each time they’re used. The good news is that over the past 18 months we’ve noticed a general improvement in the quality of steam cleaners available to buy. And it’s not just the more expensive devices that have cleaned up their act, as we’ve uncovered Best Buys that cost less than £50. So if you’ve been put off from buying a new steam cleaner because you’ve been let down in the past, then perhaps it’s time to think again. But it’s still important to choose carefully, as more than one in ten of the models you can buy remain so poor we rate them as Don’t Buys. Read on to find out more about the latest steam cleaners that we’ve reviewed. These include floor steam cleaners for blitzing your entire home, handheld models for your bathroom tiles, a carpet steamer and the latest Karcher steam cleaners. Want to know which models are Which? Best Buys? Head to our best steam cleaners. Upright steam mops are the cheapest and most basic. Wheeled cylinder models let you connect different cleaning attachments to the flexible hose. These are pricier but more versatile. 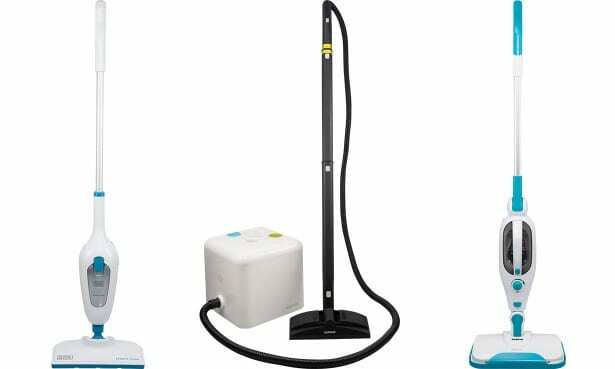 Two-in-one steam cleaners comprise an upright steam mop and a detachable handheld steam cleaner. They often offer the best value, although their smaller water tanks mean they can’t steam for as long as cylinder units. Click the links, below, to read our full reviews. The Black & Decker FSM13E1 is a simple, lightweight upright steam cleaner that’s designed for use on hard floors. It weighs just 2.1kg, making it the lightest upright cleaner that we’ve tested. At a cost of only £45, it’s also great value. The Dupray Neat is a cylinder steam cleaner that looks like a large white cube on wheels. It comes with lots of handy attachments, and the huge water tank means it can produce steam for almost 40 minutes. Although not widely available on the high street, it’s easy to buy online and comes with a generous warranty (three years for the device and a lifetime for the boiler). 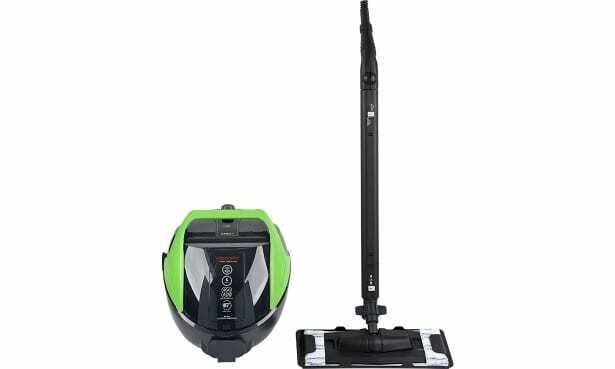 The Beldray 12-in-1 Steam Mop is a dual-purpose steam cleaner that combines an upright with a handheld unit. As with the Neat, it comes with a generous number of accessories. These include grouting and scraping tools, as well as a carpet glider and a window cleaner. It also has a filter to help prevent limescale build-up. Handheld steam cleaners are easy to carry around and to store, unlike bulky floor cleaners. They give a concentrated burst of steam through a nozzle and usually come with a range of attachments for different surfaces. These lightweight options are handy for small tasks, such as refreshing your bathroom tiles or cleaning around your kitchen sink, but because they don’t steam for long they’re not really suitable for anything more. 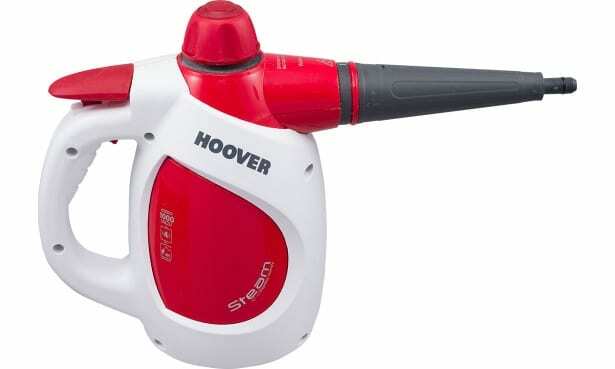 The £35 handheld Hoover Steam Express SSNH1000, below, weighs just 1.7Kg – so it won’t leave your arms aching after use. It heats up quickly and Hoover provides you with a handy jug to top it up. And you’ll need it, because the small water tank only gives eight minutes of cleaning time. A steam cleaner isn’t really designed to properly clean your carpet, but some models can refresh the pile and even shift stains. If you want a device to use on your carpets, then look for one with a carpet glider attachment. This fits on to the steam head, lifting it up and enabling the head to slide easily over the carpet without damaging it. The Polti Vaporetto Pro 95 Turbo Flexi is a top-of-the-range cylinder cleaner, costing £270. It has a huge water tank that enables it to steam for 46 minutes. This Polti steam cleaner comes with 14 accessories, including floor and carpet attachments. Karcher, with its distinctive yellow and black designs, is one of the most popular steam cleaning brands in the UK. 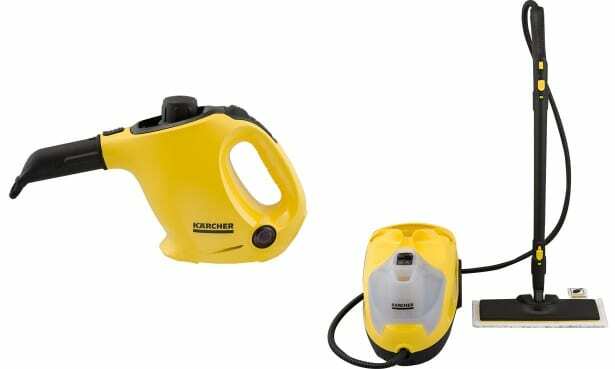 Among the Karcher steam cleaners we’ve tested recently is the Karcher SC 1 EasyFix. This is the cheapest model in the brand’s current range and the only non-cylinder cleaner in the line-up. It can be used as a handheld unit or converted into a floor cleaner by attaching the long extension tubes. Karcher claims it is ‘the ideal solution for cleaning small areas’. The £245 Karcher SC 4 EasyFix Premium is bigger and considerably more expensive. This wheeled device is aimed at people that need to clean large areas, and its powerful steam rate is designed to quickly blast away dirt and grime. Our steam cleaner reviews are designed to uncover the best steam cleaners you can buy, helping you avoid the models that leave dirt and grime behind. We assess how well they’re able to clean floors by measuring the time and effort it takes to shift dried-on pasta sauce and sticky drink stains from smooth and textured floor tiles. We also rate how successfully they remove stains and dirt from wall tiles and grout, glass and deep crevices. We then check that they’re simple to use, rating everything from how easy it is to connect the attachments to refilling the water tank, and we monitor the steam output to see if it drops off after repeated use. So you can be sure that any models we recommend as the best steam cleaners are worth buying. See our expert steam cleaner reviews.